Discover its features below and place your order for plans. The Sailing RowCruiser is the most versatile boat we offer. We have taken the basic RowCruiser hull (a versatile boat on its own, which provides sleeping accommodation and impressive rowing performance) and added a performance ketch sailing rig with planing amas (outriggers). The result is a boat that can sail up to 11 or 12 knots, or in calms can be rowed at 4 knots for hours. This is an economical boat that turns heads, and straightforward stitch and glue construction is utilized for the three hulls. The main hull can also be used on its own as a simple mono-hull rowing vessel. The small cabin is sufficiently sized for an adult to sleep comfortably in weathertight accommodation while anchored or at dock. The cabin is also an ideal passenger carrier, protecting occupants from wind and spray. An adult and a small child can comfortably fit in the cabin while underway. Click the image below to see the Sailing RowCruiser Photo Gallery. 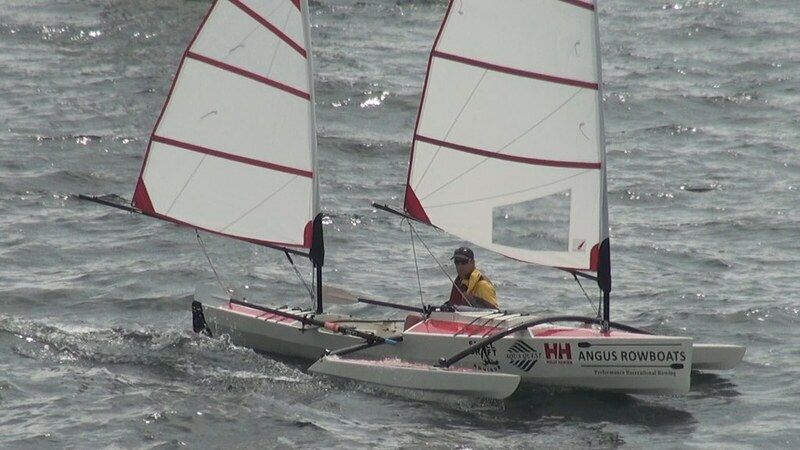 The boat has been carefully designed so that the amas (outriggers) and sails are clear of the rowing area, so the vessel can be sailed and rowed simultaneously when winds are light. It is designed to use a sliding seat rowing system, which is an efficient and fast way of moving the boat by human power. Careful consideration has also been made for trailering the boat. The amas, akas and sailing rig all fit inside the central compartment of the main vessel (protruding out the companionway) for easy trailering. The amas are shaped so as to mimimize drag when in the water. A shallow vee presents a shape that planes at low speeds, and buoyancy kicks in quickly to prevent deep submersion. And our unique hollow-shaft curved laminate wood akas (cross supports) provide exceptional strength while being lightweight. Click here to view linesplans. Click here for indepth design details and our inspiration behind this project. Watch videos detailing the RowCruiser preparations taken for the R2AK. Watch the RowCruiser on a training run and see the electronic tiller used in the RowCruiser. The boat is excellent in a range of conditions and it consistently performs well. It competed in the Race to Alaska (R2AK), a 750 mile race on the along the rough coast of western Canada and Alaska and placed first for boats under 20 feet. The Sailing RowCruiser plans and manual are, in fact, two different plans sets. It includes full sized plans and manual for our standard RowCruiser vessel, and our sailing conversion plans/manual, which include full sized plans and directions to construct the amas, akas, foils, sail mounts etc. Each illustrated manual is over 70 pages long, and all the shapes, including hull panels, are printed out in full-size for easy transcribing. Additionally, a complete list, including URLs, is provided for online sources for every piece of sailing gear required – from blocks to sails. For those building the basic RowCruiser hull from the kits sold at Small Craft Advisor, just the sailing conversion plans are required. Kits are sold exclusively by our partner Small Craft Advisor, and can be purchased here. Total cost of constructing the basic RowCruiser Hull is $1300 and $1820 for the sailing components. These prices are based on online suppliers (including average shipping costs) which we provide details for. Total cost to complete the Sailing RowCruiser (including cost of plans) is approximately $3500. For those building the central hull from our kits and constructing the remainder from plans, the total cost is about $4500. Watch a demonstration video of the boat below. We provide sliding-seat/rigger kits suitable for rowing the Sailing RowCruiser. The vessel also works well with a fixed seat rowing system. Instructions/templates for installing the sliding seat system are provided within the Cruiser instructions. To purchase the Sailing RowCruiser Plans please click on the red link below. Includes PDF files for the full-sized plans and manual that can be printed and DXF files that can be used to cut the plywood at a local CNC shop. Includes full sized plans for RowCruiser and Sailing Conversion Plans for Canoe/RowCruiser (save $9 by purchasing the plans in this package). DXF files are available for an extra $60. If you have already bought the RowCruiser plans or kit you can buy the sailing conversion plans separately.